The Polish giant lost his last match Saturday morning but his name will live on in the annals of wrestling history and pop culture. Walter (born Edward Walter Spulnik on October 13, 1928) was born in Windsor, Ontario but lived out his years in Massachusetts. When I was a child, the wrestlers names most often mentioned by my older relatives were Whipper Billy Watson, Gorgeous George, and always together, Yukon Eric and Killer Kowalski. It was only when I got into the wrestling game in my 20's that I learned that Kowalski had not bitten Eric's ear off, but rather had accidentally sheared the cauliflowered appendage off with a kneedrop in a bout in Montreal. The notoriety made his career, and he held recognition as World Champion in the hot Montreal market 12 times and headlined there into the mid-70's with and against legends like Mad Dog Vachon, Eduardo Carpentier, Don Leo Jonathon, Johnny Rougeau, Yvon Robert, Hans Schmidt, Gene Kiniski and Jean "Andre the Giant" Ferre. Kowalski also held titles in the heyday of the Hollywood/Los Angeles promotion, in Texas, Calgary Stampede, Hawaii, and was tag team titlist in the WWWF with Gorilla Monsoon (1963) and Big John Studd as the Masked Executioners (1976). In the last half of the 1960's, the American Wrestling Alliance won a turf war against the Vancouver-based All Star Wrestling promotion for control of the Winnipeg market. When it came time for AWA champion Verne Gagne to establish himself as top man in the eyes of the fans, a 3 match feud with Kowalski turned the trick. By coincidence, his last appearance here marked the first of the now senior member of the local promoter fraternity, Tony Condello. In the 1980's he became well known for TV appearances in connection with a wrestling board game ("It's FUN!!") and his wrestling school. Among his more famous students are perennial WWE champion Triple H, women wrestler Chyna, Perry Saturn and his Eliminators tag team partner the late John Kronus, and most recently Frankie Kazarian who moved from California to learn from the old master of the Claw. 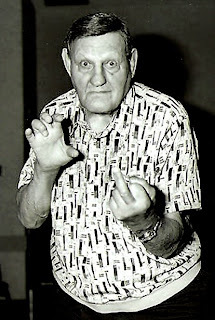 Kowalski was a regular at the Cauliflower Alley Club annual gatherings and courtesy of the reknowned photographer Brian Howell, above we present a never-before-seen Black and White portrait from 2006. Services for Walter will be held Wednesday, September 3rd at the Weir Funeral Home, 144 Salem St., Malden, MA. Afternoon Services will be 2:00 PM to 4:00 PM and Evening Services will be 6:00 PM to 8:00 PM. The Funeral will be on Thursday morning at 9:00 AM at St. Joseph Church, 790 Salem Street, Malden, MA. There will be a Killer Kowalski Fundraiser at the Malden Irish American Club in Malden, MA on Sunday, October 26th at 2:00 PM. All money raised will go to Kowalski's Wife Theresa to help with medical expenses. For more information on the Kowalski Wrestling Fundraisercall 781-324-9568. In the past two months, The Great Canadian Talk Show completely dispelled the old excuse of MSM that "there is no news to report in Winnipeg in the summertime." - and our 3 part series by Captain Audio into the Sagkeeng and Cree Nation First Nations CFS review reports, the role of the NDP government, and unreported-in MSM complaints of physical intimidation, backdated documentation, payroll loans, and the total failure of proper Board governance. plus special thanks to -- the Kick-FM morning girls Kate and Chelsea, Slurpee Girl, board operators Shannah-Lee, Broose, Young Josh, Wonder Boy Taylor, Spirited Kenny, senior producer Captain Audio, and the King of Corydon, Frank the Italian Barber. We have also had many callers, on and off-air, that contributed their viewpoints, as well as hundreds of listeners who took the time to send us their tips, reactions, thoughts and complaints to talk@kick.fm. Starting Tuesday, September 3rd, we launch our third season on Kick-FM, with an expanded 90 minute format, more guests and callers than ever before, and a new crop of students and volunteers who share our commitment to generating quality alternative media content on the airwaves. With a legislative session resuming on Sept. 8th and a federal election around the corner, more listeners than ever are relying on our show to help them analyze who is being held accountable, and who is showing leadership locally and nationally. Your support is why we present 'The Best in Modern Talk', 6 days a week on 92.9 Kick-FM. Lastly, here's a blogger who had a unique perspective about the show: http://waverleywest.blogspot.com/2008/08/good-as-gold.html. Thank you David for your kind words. What was really impressive was the obvious respect the students and staff have for each other. We spoke to 3 of the students on-air (2 single mothers), and all had experienced a difficult path in life before resuming their education. With the help of CDI they were able to find a course and schedule that could work for them. Acting Director of CDI Winnipeg Tahl East announced a prize draw, for anyone that makes and attends an appointment to learn more about the courses at the College. If you (or someone you know) is interested in their programs such as Addictions Worker, Dental Assistant, Legal or Medical Office or Business Administrator, or their IT Courses, call CDI at 942-1773, and tell them you heard about the school on KICK-FM. Anyone attending an interview before September 4th will be entered in a draw to win: A brand new fresh-outta-the-box Wii, two tickets to the Bomber-Rider Banjo Bowl Football Classic, or gift certificates from Starbucks. Our thanks to Tahl and the faculty and staff and we will follow up with them through the year to get feedback from the students about their course progress, job searches, and how CDI has helped them and their families towards a better future. And special thanks to Young Josh and Wonder Boy Taylor for handling the technical challenges of the remote without a hitch. Today, Stacey Ashley of CTV rejoins the show and I may be taking her up on her suggestion that she ask me the questions for a change; and Jon Cutler will phone in around 4.45 and explain the training process and personal decisions he has had to undertake, before accepting a developmental contract with World Wrestling Entertainment (WWE). It's been quite the journey for the 230 Lb. product of Selkirk, including the typical indy wrestling experience of wrestling in front of small crowds in far-flung halls and bars, in-ring mismatches, and being pinned on RAW by a Diva while being made famous by former NFL'er turned announcer Mike Adamle, who uttered the phrase now available on T-Shirts everywhere Jon appears, "The Cutler Did It". Jon's facing Outlaw Adam Knight in the main event at the PCW card Thursday night at Dylan O'Connor's on Pembina, in what will be the last we see of Jon around these parts for awhile. By the way, Wednesday night about 11 PM, the evening replay will be of one of our most talked about ! It's our episode from last Wednesday August 20th, when we challenged Free Press columnist Gordo Sinclair to prove his mettle and run for Mayor against Sam Katz himself, and stop using his column to smear Katz with labels such as "Tuxedo Tory" to promote the return to the Mayors' chair of his favorite urban visionary, Toronto's own Glen Murray. Thursday -- we present part 3 of our look into the CFS reports into the Sagkeeng and Cree Nation agencies and their multiple failures to engage in even rudimentary proper administrative practices, despite millions of dollars passing through their books. The end result has been children tortured and killed while in care, burned-out staff and foster parents, and the embarassment for the NDP of having to enshrine in legislation the basic common-sense idea that the safety of the child, and not the blind devotion to the failed AJI mandate of race-based care, is paramount. By the way we are at Day 9 of the Macintosh Watch, as we await acceptance of our invitation for Family Services Minister Gord M. to come into the studio and explain the responsibility and accountability of the government for the run-amock agencies taking retreats to Calgary and Niagara Falls while the children in their care suffered and died. -- on Labour Day Monday we will have a Best-Of episode to be announced. -- Our new season starts on Tuesday September 2nd, with our new expanded format. We'll be on from 4- 5.30 PM every weekday, and we'll have even more news about TGCTS on the Kick-FM airwaves and in the community! -- Thursday, a local news executive will appear on Thursday to discuss their news room operation and role in the MSM. Thanks to you readers and listeners, and the mentions of TGCTS on 92.9 Kick-FM in various local blogs, this blog set new records this month already, in the what MSM news types claim is the deadest part of the year. Proving that the hunger for knowledge, information and opinion doesn't take a summer vacation in Winnipeg. Once again, welcome to all our new readers and listeners ! Ever since we challenged award-winning columnist Gordon Sinclair to toss his own hat in the mayoral ring and run against Sam Katz himself, and stop hiding behind surrogates like Glen Murray or Lloyd Axworthy, Winnipeg Free Press employees have been buzzing on the internet about our show and keep tuning in, anxious to hear what the latest episode will bring. And a surge of Free Press readers have been emailing us with support for our show and our breaking stories. The alternative media has been opening people's eyes to the role of the gatekeepers in Winnipeg and how they try to control the news. The growth of the show by an extra 30 minutes starting in September is a direct result of an audience hungry for more information and a chance to speak up on our call-in segments. We will continue to hold elected officials and the gatekeepers in the mainstream media accountable, as per our promise on 'Manifesto Monday' in January. Tomorrow at 4 PM, we expose the outrageous racist comments made by a public figure in the wake of the Inquest into the police shooting of Matthew Dumas, which are sure to shock those who closely followed the hearing. Welcome to our new readers in Western Manitoba and Brandon ! and next Thursday, August 28th, Part 3 of our exclusive analysis of the recent official reports about the Sagkeeng and Cree Nation Child and Family Services failures, by which time the Macintosh Watch (waiting for the acceptance of our request for an interview with the Minister) will be at Day 11. If you have any information or concerns about CFS in Manitoba please email talk@kick.fm, your anonymity is assured. Today at 4 PM we will have part 2 of our look into the report into the death of Gage Guimond under the "watch" of Sagkeeng CFS. The financial reports we will detail, expose an agency that was used to advance the personal agendas of power-brokers -- at the expense of child safety and human life, all done with under the aegis of the NDP government devolution policy. As well we will also tell you about the report into the Cree Nation CFS, which contained 21 recommendations. Already one of them- that the Board of the agency curtail excessive spending - was rejected out of hand because, well, they have some sort of sense of entitlement. We'll tell you who these people are, later today. Our request for an interview with Family Services Minister Gord Macintosh has been forwarded to his office, and we await his response. On August 3rd, in an op-ed piece in the Free Press, representatives of True North defended their original financing agreements with governments, after the Freep published a piece entitled "This Time Full Disclosure" written by Rocky Kravetsky on July 13th. "... In fact, some of Winnipeg's most cherished locations and institutions have been developed and have flourished on the basis of some variation of this public/private model including The Forks (loses money), Assiniboine Park ( financial disaster pending), the Manitoba Theatre Centre, the Royal Winnipeg Ballet, the Winnipeg Symphony Orchestra ( bailed out how many times? ), the Winnipeg Blue Bombers (speaking of bailouts), the Winnipeg Art Gallery, Canwest Global Park and the Winnipeg Goldeyes. " "The Canadian Museum for Human Rights will be another shining example of such an initiative." For the moment, let's leave aside the dubious nature of the publicly claimed costs which have not risen in 4 years, various government subsidies and "contributions", or the use of taxpayers dollars for Premier Gary Doer to trot around the country at the side of Gail Asper to practice the Museum's unique version of corporate panhandling in the guise of "world class destination". Focus instead on the question of, what will the Museum pick and choose as the causes and issues to be featured? Today, Canada's leading blog, Small Dead Animals, picked up a story about the Ontario College of Physicians and Surgeons, which has conducted a shameful attempt to secretly change their rules without giving doctors a fair chance to respond. The new rules would see doctors targeted for following their morals, hauled before a kangaroo court in the name of "Human Rights". "The document responds to legislative changes, which, according to the Chair of the Ontario Human Rights Tribunal, will see a twenty-fold increase in hearings before the Tribunal - from 150 to 3,000 cases per year. According to the College, the Tribunal may take action against a physician who refuses to provide or refer for procedures that he finds morally objectionable. The College strongly suggests that the physician’s freedom of conscience and religion will be ignored because “there is no defence for refusing to provide a service” in such circumstances. The College also plans to force objecting physicians to actively assist patients to obtain morally controversial services. .. The College posted the draft policy for consultation near the end of June, with a response deadline of 15 August. The Project, noting that there was no news release about the draft and that “the mid-summer timing of the consultation is less than satisfactory,” has asked the College to extend the deadline by 90 days. "The focus groups also revealed that there is tremendous interest across the country in human rights issues". - this slimy attempt to hoodwink and intimidate doctors in Ontario and to refuse them their rights to follow their private beliefs, under threat of a government-mandated punitive, exhausting, expensive show trials. But don't expect to see anything in the Museum about the world-class abuse of human rights, in the name of human rights, by bureaucrats who claim to administer human rights legislation. Thanks to James Turner of the Free Press for his outstanding discussion with us yesterday about the types of juvenile violence cases coming before Youth Court, the devastated morale of Manitoba Youth Centre staff, and the prevalence of the crack and cocaine trade found in the case files of gang-bangers who are running wild in the city. Spirited Kenny and his other better half Mrs. Spirited Kenny have welcomed their first child and we are thrilled at the news. Nathan Wolfgang Robert was born on Monday Aug 11th at 6:56 AM , weighing in at 8 lbs 13 oz, and measuring just under 21 inches. He demanded his first meal be Half Pints newest product, Baby Brew, but was overruled. The Great Canadian Talk Show will bring regular reports to listeners on the journey of Kenny from scientist to diaper-changer. The mainstream media's coverage of the Section 4 Review in Regard to the Death of Gage Guimond had many holes indeed. Some MSM sympathisers have said "The news needs to be fresh. This is old. They need to move on". Maybe. However, combine that notion with the calculated sunny Friday timing of the release and the Monday morning redirection by the NDP and you have a classic smokescreen. The release of the damning report came early Friday July 18. Morning talk show hosts had likely already done their show prep and were set to go on air when the 109 page review hit the desk. What to do? Scan through the report and try to get some info out to the people and maybe get some CFS or Government reps on the air to respond. Uhm, nobody's available until at least the afternoon. Niiiice. - How Sagkeeng CFS had a "lack of respect for Gage's medical condition and that a qualified medical practitioner recommended a smoke free environment for him. The Agency was aware of Gage's asthma; while the worker refused to go inside because of the strong feline odour, the Agency did not take steps to address this issue..."
- Gage's longtime foster parents developed a rocky relationship with SCFS as the foster parents started to question the Agency's plan for the children. The review says "It resulted in the children being placed with other family members who had no relationship with the children ". - The review uncovered a "lack of adherence to standards" when he was removed from the stable foster home into unsafe environments. In one case the boy was placed in a home where no criminal or child abuse registry check was conducted. - The review also found conflict of interest among staff involved in Gage's case, such as hiring unqualified family members and ignoring of concerns raised to management . But we will look at the inner workings of SCFS- much that went totally under the radar. * The conflict of interest as mentioned above; more details are needed. The former Executive Director had a hand in appointing his own supervisors (Board of Directors). This Board often let the ED call the shots "without further discussion", nor did the board monitor the ED's work. * The ED created a Paralegal/Computer Tech position at the Agency, seemingly for the sole purpose of hiring his close relative. There was no evidence the position was advertised prior to the hiring. * When word of the review came "Agency Management was advised by the Southern Authority to secure all files associated with the case. During the course of staff interviews, it was found that staff involved with the case was instructed, after Gage's death, to complete all documentation for the files in preparation for review". * Staff told the reviewers that "the Executive Director had instructed staff not to co-operate with the Southern Authority" during the review. * SCFS was unhappy with the review, stating in a letter to the Southern Authority; "It is quite disturbing that one staff member is being targeted for the misfortunate (sic) that has occurred....The agency is in constant scrutiny by the Southern Authority, the agency has to question what is the ulterior motivate (sic) in this continuous questioning." * Staff who questioned the qualification of some hired- meaning ED's close relative- were labelled "complainers" and railroaded out. * ED ordered finance to pay for the tuition of his close relative for the University of Manitoba BSW cohort training. This, while other staff were led to believe tuition would be covered- then it wasn't. * This close relative of ED was not qualified to do home assessments. He was, in fact, found to be doing them despite ED's denial to the Southern Authority. This close relative was "assigned to do home assessment of the placements used for Gage"
* SCFS salaries were found to be higher than other agencies. * Should we get into the $45,000 dollar Calgary retreat? The one that the qualified staff were on in July of 2007 when Gage died? "Staff advised that while in Calgary, they listened to a couple of speakers, played games and went shopping. There was no conference or other venue going on in Calgary that the Agency was participating in." Can anyone say 'Stampede' ? With all this mess, is a list of common sense recommendations and a few human resource outstings enough to solve this grotesque problem? Or- does the CFS system need to be torn down and rebuilt without the influence of political correctness. The Great Canadian Talk Show, the alternative media and the public at large are waiting for Family Services Minister Gord Mackintosh to respond. We'll have Part 2 of our look at the Guimond report next week with Captain Audio. If you have any experiences with any Manitoba CFS agency or the government family Services department to share you can contact us in confidence - talk@kick.fm. A full deck of race cards was played in a bizarre street theatre press conference held by a half dozen First Nations organizations, in front of 788 Simcoe Street today. While some leaders made statements that attempted to balance the families' grief and a search for truth into what led to the shooting of 26 year old Craig McDougall, other militants chose to selectively disclose the accounts of "credible witnesses" to smear police as enjoying "a killing spree" and to threaten the public peace. According to the leaders, Winnipeg police were responding to a single call for assistance from the house after a fight between two girls. They claim McDougall, who they admitted had a criminal record, was walking home and was on a cellphone with his girlfriend, standing inside the yard, when 6 cops came up to the short fence and gate. * "Deadly force was not necessary"
* "If the taser malfunctioned is the use of deadly force legitimate"
* (The family was) "treated like criminals"
* "We recognize the need for policing ...we want the officers to apologize to the family." A statement was read by the father of the deceased Brian, who complained he was thrown to the ground and handcuffed mere feet from where his son was bleeding from his wounds, "if he had a knife I did not see it", and "we are afraid for other aboriginal youth." Chief David Harper of Garden Hill asked, "What was the danger to the 6 police that stood behind the fence... are we sure there was a weapon?" and tastelessly raised the takedown of Vince Li in last weeks' Greyhound Bus decapitation murder of Tim McLean Jr. He then ratcheted up the heat on police Chief Keith McCaskill, saying the chiefs want a representative in the investigation team and they were "challenging his leadership", ending with the first of many orchestrated calls for a full public inquiry into the Police Service. Next, Chief Robert Flett of St. Theresa Point went down the Aboriginal Justice Inquiry road, demanding the AJI recommendations be implemented including an Aboriginal Police Commission, an independant police complaints agency, and the establishment of an "Aboriginal Justice College". Flett also announced that Don Worme, the lawyer most recently seen depicting police as racists at the Matthew Dumas inquest, had been retained as well as a Private Investigator. He demanded a full inquiry "given recent increases in complaints and incidents" involving police, offering no proof of his assertions, while adding that a Human Rights Commission complaint and a complaint to the United Nations was being filed. After a nearly incomprehensible speech by MKO head Dr. Sydney Garrioch, acting Grand Chief of the Assembly of First Nations Billy Jo Delaronde took the mic. He firstly thanked Chief McCaskill for briefing him after the weekend shooting, but said "our youth do not feel safe" and they have "a severe lack of trust with Winnipeg police". He echoed the call for an inquiry reminding the media of Mayor Katz' past comment that it was "a broken police service", and said that they would be making a presentation to an August 27th public forum into the police. The final speaker was Morris Swan-Shannacapo of the Southern Chiefs Organization, who ignored the facts and instead immediately claimed that the death of Matthew Dumas was parallel to that of JJ Harper in 1988, and then refered to the police-involved deaths of B and E artist Michael Langan two weeks ago and of McDougall. Using imagery directly lifted from the playbook of terror mastermind Yassir Arafat, Shannecapo bellowed "again and again and again and again, we extend an olive branch (to the police)" and demanded an inquiry into "the killing sprees that seem to be enjoyed by the Winnipeg Police Service", as he harkened to the book about the JJ Harper killing "Cowboys and Indians", by nowhere to be seen Gordon Sinclair Jr.
"Is this the 5th chapter, the tenth chapter? I hope it is the final chapter!" Swan thundered to applause from the native onlookers. In the question and answer that followed, it took over a minute for the group to confirm the police were responding to a call for help from the house. The next question was about how was McDougall related to JJ Harper (dad's brothers wifes' brother, or an uncle in law once removed). Alleged details of the incident and aftermath came out of the next questions. The father called police because a fight broke out, "a credible witness said he was talking to his girlfriend"-- the girlfriend herself; an uncle who had a badly swollen black left eye was pointed out as a victim of police brutality in the takedown of the house; and that the girlfriend heard 4 shots, and that McDougall's last words were "goodbye". Then a reporter from an aboriginal publication asked, how close are we to civil disobedience or to a race riot?" He was told "ask the general public, we are really really close", but then Delaronde let fly, saying First Nations youth are "very very close to taking things into their own hands... we're at one minute to 12". Then when another reporter asked for clarification of the alleged fight between the two girls, a diversionary bombshell was dropped. It is now being claimed that on his birthday, June 20th, Craig McDougall was taken to the outskirts of the city, beaten by police and had to walk back to the city. There was no explanation about why the MKO, SCO, or any other advocacy group had waited until the end of the press conference to make the allegation or what proof there was beyond hearsay. The moderator took one last question, and nodded in our direction. We asked if the witnesses say anything about whether police had given direction to McDougall when they approached the fence to put his hands in the air or whatever, and if he complied with their order. After insisting their witnesses are credible and trumpeting their version of events to paint Winnipeg police as trigger happy, the Acting Chief of the AMC told the media, they want to see what Chief McCaskill put in writing about what went down, and only then would the Chiefs reveal what their witnesses say they heard before the fatal shots were fired. - specifics of McDougalls' admitted criminal record. More today at 4 PM. on the show. A statement was already issued accusing Winnipeg Police of "wrongdoing" and committing a "senseless killing", ignoring reports that police believed Craig McDougall -- who lived at the home with his father and sister -- was wielding a knife and then was not dropped by a taser. - What the neighbours heard in the weeks and hours leading up to the shooting.